The final Ski Jumping competition of the 2018 Olympic Winter Games was the expected battle of the top 3 nations. But the team of Norway, represented by Daniel Andre Tande, Andreas Stjernen, Johann Andre Forfang and Robert Johansson, only made it really exciting in the first half of the event. In the second round, the vikings showed what they are capable of and the competition had no real chance anymore. The fight for the second place was highly dramatic and not decided until the very last jump - with the better end for the German team. It became clear relatively early in the second round that the Norwegians will be unbeatable today, but the battle for silver between Poland (Kamil Stoch, Dawid Kubacki, Stefan Hula, Maciej Kot) and Germany (Karl Geiger, Stephan Leyhe, Richard Freitag, Andreas Wellinger) turned out to be a real nail-biter. Germany was 0.6 points behind Poland before the final jumpers Andreas Wellinger and Olympic champion Kamil Stoch. Wellinger landed at 134.5 m and scored the decisive points against Stoch, who jumped on the same distance, and so Germany came in close ahead of Poland. For Norway, this was the 11th Olympic gold medal in Ski Jumping, the first in a team competition. Norway is now also the second nation, after Germany, to win Olympic gold in all four Ski Jumping events. Surprisingly, not one of the two individual medalists, but Ski Flying World Champion Daniel Andre Tande was the outstanding athlete in the Norwegian team. Tande was clearly the best of the first group in both rounds and so he earned his team an early lead. Johann Andre Forfang: "This was our main goal already before the season. And that we were now able to achieve what we have been talking about before the season is huge for us." The German athletes also convinced with a close team performance. Richard Freitag said representative of the team: "This is a success for our entire team. That's not just the four of us, there are many other jumpers and especially also the coaching staff, the team behind the team. This is a good thing for everybody." Andreas Wellinger and Norway's Robert Johansson have won medals in all three competitions in PyeongChang and this makes Wellinger the first German ski jumper with four Olympic medals (gold and 2x silver in PyeongChang, team gold in Sochi 2014). For Poland, this was the first ever Olympic medal in a team competition and of course, the athletes were extremely happy with this result. Maciej Kot: "This is a historic moment for our team and our country. The competition was on a high level and it was so close after the first round. We were fighting until the end and I think it was a nice competition to watch for the spectators." 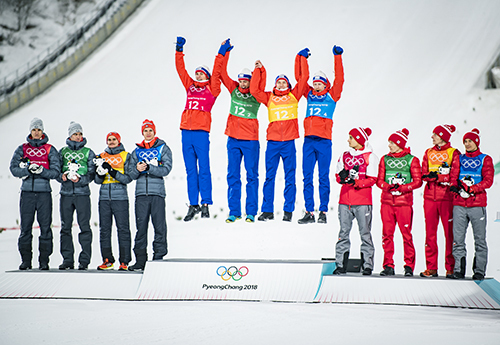 The team of Austria finished fourth, already about 100 points behind the podium, but Stefan Kraft, Manuel Fettner, Gregor Schlierenzauer and Michael Hayboeck showed their fighting spirit. This fight was impressive and ended in fourth place, more is simply not possible for the Austrians right now. Slovenia was fighting for the fourth place with the Austrians for a long time, at the end Peter Prevc, who showed a very good performance with two jumps over the 130 m mark, Jernej Damjan, Anze Semenic and Tilen Bartol came in fifth, ahead of Japan (Taku Takeuchi, Daiki Ito, Noriaki Kasai, Ryoyu Kobayashi), OAR (Alexey Romashov, Denis Kornilov, Mikhail Nazarov, Evgeniy Klimov) and Finland (Janne Ahonen, Andreas Alamommo, Jarkko Maeaettae, Antti Aalto). The team of the USA narrowly missed the qualification for the final round of the best eight teams in eighth. Kevin Bickner could once again show a convincing performance with a strong jump of 131 m.
The Czech Republic, Italy and the hosts from South Korea finished on the places ten, eleven and twelve.